"Imagine if people, in the tens of millions, filled the streets, powerfully declaring that this regime is illegitimate and demanding that it not be allowed to rule! The whole political landscape would be dramatically transformed, every faction within the established power structure would be forced to respond—and all this could well lead to a situation in which this fascist regime is actually prevented from ruling. This is not some idle dream but something which could be made a reality if all those who hate what is represented by this fascist regime translate their outrage into firm determination and massive mobilization to create the conditions which make this possible." I’m going to get to WHY we have to put all of our energies now to stop this regime from ruling, from taking the reins of power, but if you’re here you already want to do that, so I’m gonna start with the big question that probably most of you have right now: how could this actually be done? By bringing DC to a Halt! Huge numbers of people getting into the streets day after day, night after night, creating a political crisis such that the Trump-Pence Regime is prevented from coming to power. Let's get into it. Imagine this: hundreds, maybe thousands, of people form up this Saturday afternoon, the 14th, at 4 o’clock. Different kinds of people—people who’ve been active in movements or their communities or their workplaces and people who have not, people for whom this is their first time protesting, or first time in years, but they HAVE to do whatever they can to prevent the fascist from taking the reins. They saw the New York Times or Washington Post ad and got in touch… they saw the NO! in their neighborhood or where they work or hang out… they saw something on social media because of the hard work that is going to be done by people in this room… they saw something on TV and all that made it seem like “okay, this is real”—and there they are on Saturday afternoon the 14th before he gets sworn in—in order to prevent that from happening. They start to march, not enough to stop Trump but enough to get the support of the passing cars and pedestrians. Cars honk in support, people join in, the march spills into the streets, people going into the night, the people in and around the march tweeting, texting, Facebooking, Instagramming and all the rest of that jazz, hey, here we are, come down… This march grows, people on the march take stacks of flyers, posters, palm cards, whatever else they can get their hands on that says NO! to Trump-Pence and the fascist regime they are aiming to install. People block traffic, they won’t be contained, they make it clear in all kinds of different ways that they are determined that this not be allowed to go down, and they call on everyone to join them. As the march grows, people split off and go into different places, different neighborhoods… Suddenly, that night, where no hope to prevent this fascist regime had existed before, now there is hope. Before people leave, they get organized for the days ahead. All day Sunday people are fanning out with posters, stickers, leaflets of the NO!, printing more, and spreading the word in every which way to be at McPherson Square at 4 o’clock… that’s the gathering time. People going all that day to church services, to the new Museum of Black History and the Holocaust Museum and Museum of the American Indian—everywhere where people go to think about how we got to where we are today… people going to movie lines and coffee shops and brunch places… everywhere there are other people gathering… people going onto social media… spreading the word—4 p.m., we gotta prevent Trump. Where hundreds gathered the night before, now there are thousands. And the same thing happens—blocking traffic, gathering people, going into the night. Monday, same thing, getting out all day to recruit more people to come that afternoon at 4. But all that day, people also getting with people they know or people they’ve met… people coming to the organizing hubs… and getting ready to think about how do we all flood into the city on Tuesday and make manifest that we are NOT going to accept the fascist Trump-Pence regime wreaking havoc and damage on humanity for the next four years, using the most powerful state in the world to silence people and to suppress people and to prevent people from raising their head. Marches need to circle the capitol and other centers of power… stage sit-ins… not going to work… engaging in what we used to call “wildcat strikes,” where government employees just walk out… where young people leave their high schools and head downtown… where the colleges are emptying out… because people feel that NOW there’s a CHANCE. All this time, from Saturday the 14th on, going to all the groups that are fighting Trump—the ones who came out to protest the march of ghouls in the confirmation hearings this week, the ones out there Saturday and Sunday protesting for immigrant rights, the ones out there Sunday and Monday in the movement for Black lives, commemorating MLK Day, the people getting ready for the women’s march—going to everyone and making common cause, because let’s face it, it would be far, far, far, far better to PREVENT this dangerous and unbalanced fascist from getting his hands on the reins of power than having to deal with him once he’s got them, and is able to use the force of state to implement his fantasies of waterboarding and worse, of going after the press, of taking citizenship away from people for burning a flag, and so on down the line. And the debates will rage, passionate and serious and actually building up the unity. The more this debate rages, the better it is for us, the people who are trying to prevent what would truly be a catastrophe. People will be jumping into cars and driving all night to get to DC, they’ll be taking planes and buses, and there’ll be churches in DC and ordinary people who throw open their doors and say, yeah, sleep on my couch or put your sleeping bag on the floor of my basement, I gotta step out of my comfort zone so we can stop what would be a monstrous thing, and matter of fact I want to help out any way I can. And you’ll hear the people at the very top of society, the ones who have serious concerns about Trump but have decided to accept him and even “normalize” him, begin to raise questions whether maybe this is one of those times when extraordinary things must be done. They’ll be looking at you and wondering whether YOU are going to start to question the legitimacy of the government and they’re going to be calculating that. They’re going to look at whether having Trump come to power, someone who is so thoroughly repudiated by such a large and growing section of the people could be avoided—and we’ll be insisting No Trump, No Pence, No KKK, No Fascist USA. We’ll be raising our heads and debating not only how we win this battle and not just come out of it with someone just like Trump but without all the baggage—like Pence—but also how we got into this mess and what kind of society do we need and what kinds of changes have to be made for there to be a social order where humanity comes first.... because, after all, like the ad you saw, and some of you signed, in the New York Times and today in the Washington Post and tomorrow who knows where, it is in the name of humanity that we refuse to accept a fascist America. So that’s vision and plan of how it could be done, with everyone here taking a part and going out and getting others, and coming out on Saturday. 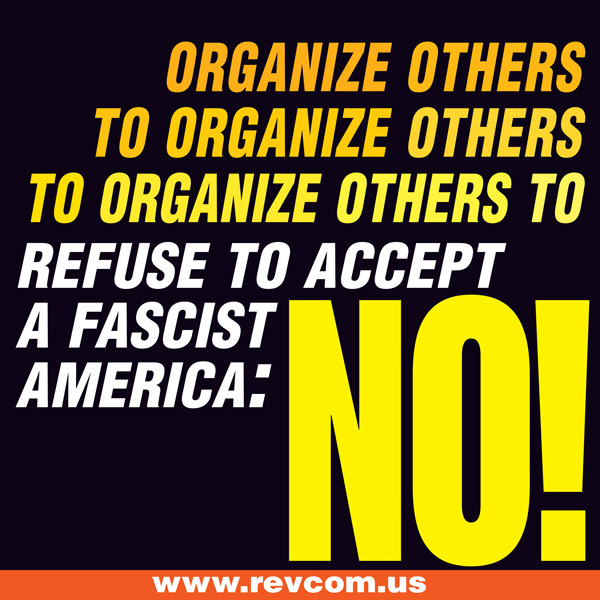 We are setting out to make history, creating such a political crisis from below by people like ourselves, in huge numbers, acting outside normal political channels with the determination to do what it takes to bring DC to a Halt, to not stop, because we refuse to live in a fascist America. You here tonight know why this must be done. You know why millions must come in the streets and say NO! Because we know what happens if Trump-Pence take power. You could walk through a list of everything that Trump has promised he will do, every threat he has made, the ugly slurs he has lodged against groups, the whipping up of a mob spirit against the press and protestors, including directly threatening people at his rallies and threatening other protestors with stripping their citizenship, the racism, the national chauvinism and xenophobia and war threats, the hatred and contempt for women that he just oozes and models… all these are horrific and should never be normalized, but they all flow from something bigger: Donald Trump is a fascist, and he is installing a gang of fascists at the helm of the most powerful state in the world. This is the Hitler of our day, people, with the ominous exception that this is a Hitler coming to power with nuclear weapons and at a time of environmental disaster. 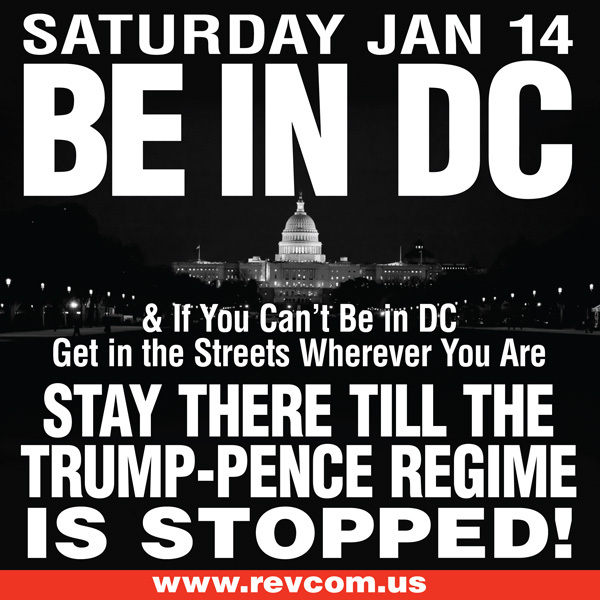 THAT is why he is illegitimate, THAT is why he must be prevented from ruling, and THAT is why we ALL need to be in the streets, beginning this Saturday, the 14th, at 4 p.m., in Washington, DC most of all and everywhere else as well. Everyone here has a mission. A mission to get more people into this. A mission to organize others. We have organizing kits available online and materials for you, and we have a welcoming atmosphere where you can come and hash out what you’re running into. We are about to do something really great for humanity and for future generations—so let’s get into it.